WARNING: This product can expose you to chemicals including Diisononyl phthalate (DINP) and Di(2-ethylhexyl)phthalate (DEHP), which are known to the State of California to cause cancer, and Di(2-ethylhexyl)phthalate (DEHP), which is known to cause birth defects or other reproductive harm. For more information go to www.P65Warnings.ca.gov. This complete VENUE lighting package includes everything you need for precise DMX accent and uplighting in smaller venues. Whether you’re a mobile entertainer or a small club owner, this versatile package delivers professional results and can handle a wide range of applications. 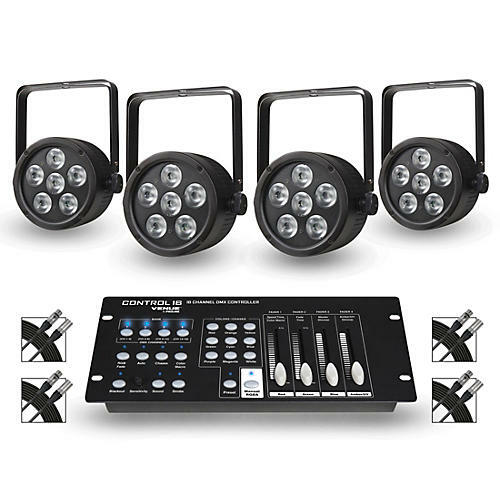 Consisting of four VENUE ThinTri38 PAR lights, a VENUE Control16 DMX controller and four Livewire DMX cables, this package puts you in the driver’s seat, giving you total control over your lighting. Ideal for smaller venues, this PAR features six 3W tri-color LEDs with VENUE’s LED technology that minimizes drops in brightness when the LED elements warm up over time, allowing your new fixture to retain premium performance and brightness. That means your show will look just as good at the finish as it did at the start. Includes dual-stage optics housed in a robust chassis with clear protective lens. Includes dual-stage optics housed in a robust chassis with clear protective lens. Plus, it boasts four operating modes (Stand-alone, Sound Active, DMX, and Master /Slave), seven static colors, 236 color macros, four preset color programs, strobe, dimming, and manual color mixing. The VENUE ThinTri38 is constructed with double yokes for precise aiming from stands, trusses, and floors, and includes pass-thru DMX and AC connections for neat cable management. VENUE's ThinTri38 also includes mix-and-match compatibility with their ThinTri64, TriStrip3Z, and Control16 DMX controller for complete scalability for large and small shows. The Control16 from VENUE is a robust, 16-channel DMX controller that provides simple, elegant control of multiple lighting fixtures. Configured as four banks of four faders, each bank operates an independent 4-channel controller with access to manual color mixing, pre-set color pallets, strobe, chase, and blackout functions. The VENUE Control16 color pallets are designed to work with any lighting fixture using a standard DMX 3-channel RGB mode. The 4th fader can be used to control Amber, White, or UV color mixing for Quad LED fixtures. When combined with VENUE’s TriThin38LED, TriThin64LED and TriStrip3Z, it produces plenty of complementary and contrasting lighting effects that will wow the crowd all night long.